Today on Vox Pop, Mark Lawson of Albany's Mark Lawson Antiques joins the show to discuss antiques and collecting. WAMC's Ray Graf hosts. Last weekend, enthusiasts from across the Northeast gathered to trade parts and stories at the Rhinebeck Car Show. Reporter Meg Heckman sent this audio postcard. Hot rods, muscle cars and automotive echoes of the gilded age are the public face of the Rhinebeck Car Show, but look past the tidy rows of glittering bumpers and you’ll see something else: acres and acres of dust, rust and chrome. It’s the annual swap, where buyers and sellers come from across the East Coast to haggle over the stuff that old cars are made of. Last week I opened a drawer in the antique high boy in our front hall and found photographs I’d never seen before. They were of my father’s family, and they dated back to the 19th century. Barbara Redfield is a retired teacher and writer in Big Indian, New York. Last Wednesday a Hudson Valley auctioneer, came to pick up my beloved antiques and family memorabilia. My secret confession is that I am a borderline "hoarder". I have been careful to hide the "stuff" in boxes and closets out of sight of friends, relatives and particularly from my own everyday world. Unfortunately my addiction to saving, rescuing and just plain acquiring has had many hidden-from-sight storage areas... an attic, two large walk in closets, a basement and a separate large storage room. Needless to say all of them were packed to the rafters! This is all in addition to a house that was decorated in what some might call "cluttered Victoriana". I, however, prefer to remember my goddaughter walking in one day at age 6 and saying, "Aunt Barb, I didn't know you lived in a museum!" Ellen Sinopoli Dance Company presents the provocative and richly imagined choreography of Artistic Director Ellen Sinopoli. Now in its 23rd season, ESDC shares its work with diverse audiences through concerts, showcases, residencies, workshops and educational outreach, seeking to enrich our community by enhancing the appreciation, understanding and experience of contemporary performing arts. They will have an Antique Appraisal Benefit on Saturday, February 8 from 10am to 3pm at the Hilton Garden Inn on Hoosick St. in Troy, NY. 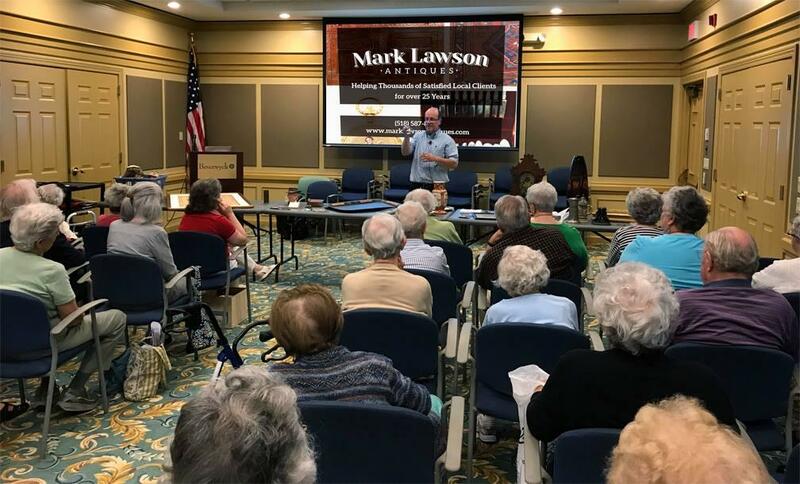 The public may attend to have antiques, unique items, gold and precious metals appraised by local experts, Mark Lawson from Mark Lawson Antiques, Dennis Holtzman from Dennis Holzman Antiques and Nancy Toomer from The House of Rose Antiques. Ellen Sinopoli and Mark Lawson join us to tell us more.